The new anime movie Mary and the Witch’s Flower, released earlier this month in the U.S., pitches itself as a whimsical, enchanting film that could fit right in with the Studio Ghibli family of classics. Its dazzling animation almost obscures a plot with holes large enough to fly through with a broom. For kids, that won’t matter. Adults, by the end, might yearn for Princess Mononoke. Mary and the Witch’s Flower is a retelling of the 1971 kids’ story The Little Broomstick. It opens with a gripping scene of a red-haired witch stealing a satchel of seeds from a burning school in the clouds. She escapes on broomstick and heads down through the clouds, crashing in the forest. She drops her seeds, and her broomstick is absorbed by a growing tree. The movie then pivots to Mary, a red-haired girl living with her great aunt in the countryside. One day, while her aunt is away at a funeral, Mary goes on a walk and encounters a black cat belonging to a local boy. That cat, Tib, leads her through the forest to a broomstick and some glowing blue flowers. Those flowers, referred to as “fly-by-nights,” burst in her hands, granting her temporary magical power. The broom whisks her away to a magical school in the clouds, much like Hogwarts. When the headmistress and chemistry teacher (voiced by the actor who plays Harry Potter’s Professor Slughorn) encounter her, she is hailed as a prodigy (apparently, her red hair signals this). Here’s where things started to unravel for me. It eventually becomes clear that the headmistress and chemistry teacher are actually experimenting on transforming animals into magical monstrosities. Tib’s cat girlfriend, it turns out, was one of them. The teachers want Mary’s fly-by-night flower so they can transform a human into a warlock who can wield all magic, an experiment that led to their school’s explosion years ago. To lure Mary into handing over the fly-by-night, the evil teachers kidnap Tib’s owner, whom Mary must rescue, and decide to make him that warlock. Mary gains the power and resolve to do so by visiting an old cottage, which actually belonged to her great aunt, whom it turns out was a powerful witch (and, years ago, stole the fly-by-night seeds). Mary ends up saving the day, tossing the final fly-by-night bulb over her shoulder and into the wind, declaring that magic is bad. 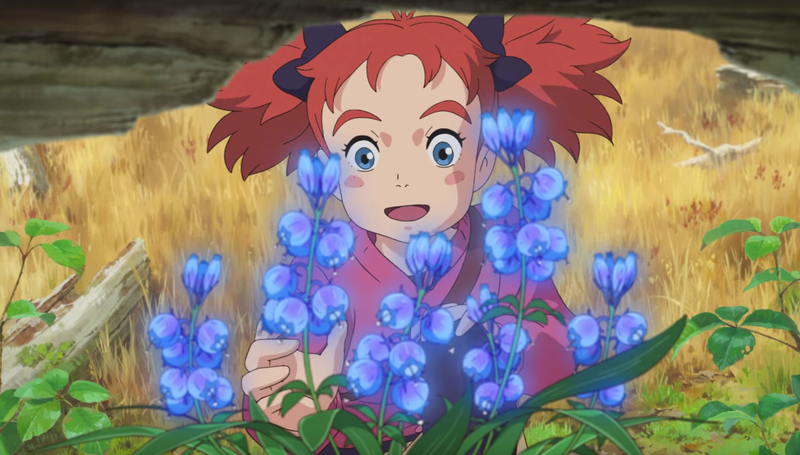 Maybe Mary and the Witch’s Flower make sense if you’re a child. Maybe Mary and the Witch’s Flower makes sense to an adult after skimming the plot. Maybe Mary and the Witch’s Flower makes sense to an adult after two shots of Jack. But questions I had about the world and its characters repeatedly jerked me out of the film. Whose funeral did Mary’s great aunt attend? How did Tib the cat, who does not appear to be magical, know to lead Mary to the magical flowers and the broomstick? Did the headmistress really think Mary was a prodigy, or was she buttering Mary up? Why can some people do magic and some people can’t? Where do other magical people live? Why did the teachers want to engineer a warlock who can do all magic? Was there a type of magic that was previously off-limits? What led them to decide that now was the right time to retry that catastrophic experiment again? Unlike most fantasy media I enjoy, Mary and the Witch’s Flower doesn’t set up a lot of worldbuilding rules early on. Throughout the movie, new rules reveal themselves. Because of that, I was constantly unsure of the scale and importance of decisions characters made. I also had difficulty understanding characters’ motives for their actions. My questions piled up until my disbelief became so heavy that I no longer had the strength to suspend it. Maybe I was thinking about it too much, but I couldn’t turn my adult brain off. Certainly, I didn’t have these questions watching My Neighbor Totoro or Spirited Away, whose worlds more convincingly delineate the line between fantasy and reality, or blend them together. Spectacular scenery and exciting action scenes coerced me back into the world of Mary and the Witch’s Flower. Director Hiromasa Yonebayashi, who animated Spirited Away and Howl’s Moving Castle, recalls his previous work throughout the film. In one scene reminiscent of Spirited Away, Mary is shown a fantastical array of mouthwatering foods in the school cafeteria. In another, reminiscent of Howl’s Moving Castle, the local boy’s long hair gently rises and falls as he’s transformed into a warlock. Other scenes, like the tour through the magical school, evoked the wonder of Harry Potter’s Hogwarts castle. Professor Slughorn’s cloyingly evil voice also helped that along. When Mary and the Witch’s Flower isn’t relying on hand-wavy cameos from those celebrated works, it became difficult to stay on board. I was looking forward to falling in love with another anime film after a year packed with spectacular ones. Mary and the Witch’s Flower is a blast to watch if you’re not thinking about it too hard, and if you’re likely to, you’re better off watching a classic Studio Ghibli movie.